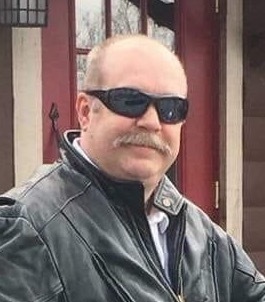 James J. Ganoe, 54, of New London, passed away December 4, 2018 after a courageous three year battle with cancer surrounded by his loving family. He was born August 12, 1964, in Tampa, FL/ MacDill Air Force Base. The son of Judith Ganoe and the late Richard Ganoe. James enjoyed spending time with his family and friends playing cards, had a love for sports, especially the Boston Red Sox and the New York Giants. He also had the trademark #45 for Nascar, Kyle Petty. James’ first love was riding his Harley Davidson Road King, cruising along back roads, trips all over to find that one special street sign and take beautiful pictures of the sights he had seen. James graduated from Windham High School. He worked at Stop N Shop as a manager from 1981-1995 and Mohegan Sun as a dealer from 1996-2016. In addition to his mother Judy, he is survived by his brothers and sister in laws, Richard and Deborah Ganoe, Steven and Shirley Ganoe, Ronald and Paulette Ganoe, Kevin and Misty Ganoe; sister, Deborah Ganoe; two nieces, Sarah and Zen; eight nephews, Christopher, Brandon, Matthew, Elijah, Roger-Paul, Joshua, Alex, and Dayvon; as well as two great nieces, Serena and Kaylin and a great nephew, Brayden. A special thank you to James' friends who made him smile with special visits during his final days. James’ family will receive relatives and friends on Sunday, December 9, 2018 from 2:00PM to 4:00PM at Potter Funeral Home, 456 Jackson St., Willimantic. His Funeral Service will be held on Monday December 10, 2018 at 10:00AM at the funeral home, burial to follow at the New Willimantic Cemetery. In lieu of flowers, donations can be made to VictoryJunction.com (A camp-foundation in honor of Adam Petty; a camp for children with illness or disability- Kyle Petty’ son); Victory Junction, 4500 Adam’s Way, Randleman, NC 27317. For an online memorial guestbook, please visit www.potterfuneralhome.com.